However, it was free and I was so grateful to be a winner so I thought I’d give it a go. I decided on the fantastic jersey I got from the market in Leeds on Sew Up North day with the intention of repeating the Cashmerette Appleton. I changed my mind (as we dressmakers do) and decided on this instead. The back is a great little detail, I used a popper at the top to make it look nice and neat. Excuse the bra though, I’ll have to think about what I’m going to do about that! 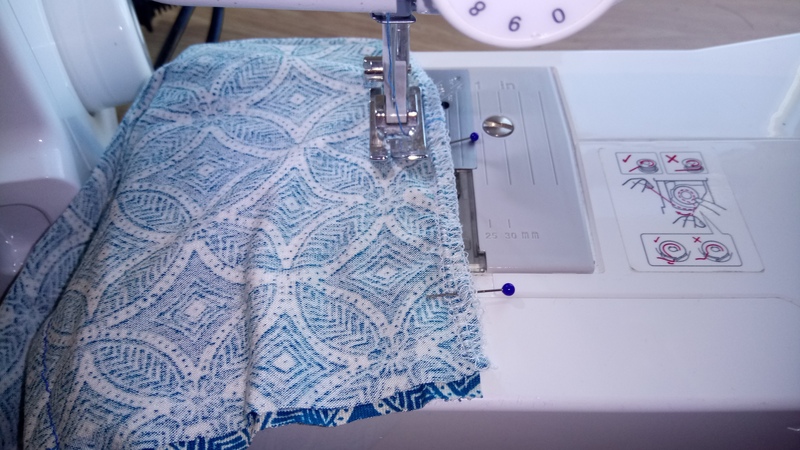 After I struggled meeting the odd shapes in the TATB Zadie Dress, I was a bit concerned about meeting the corners together right at the front of the dress as the pattern shapes are a bit unusual. However, it comes with a really helpful tip of basting some stitch lines to follow, which I promptly ignored and just used my air erasable marker to mark the corners. It worked out great. Because of fabric restrictions I could only manage a short sleeves but I inserted these. 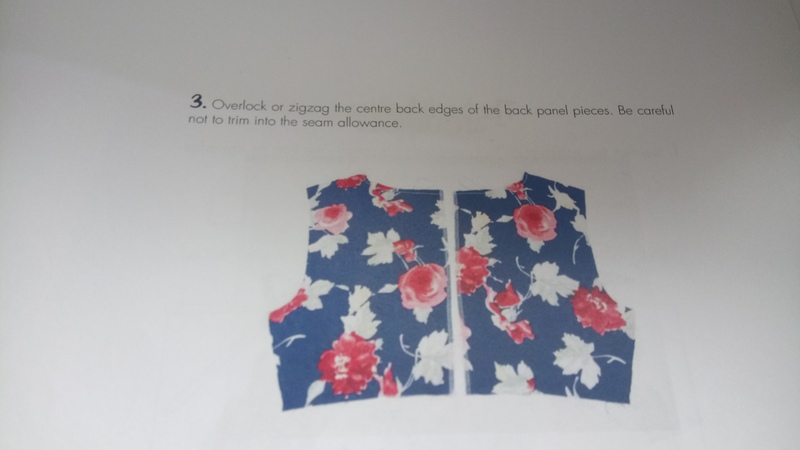 This was another step which I ignored as the instructions call for a set in sleeve but I don’t feel that is necessary with jersey so I inserted the sleeves before sewing up the sides as one. I had already extended the pattern as it looked too short for me on the pattern front, I’m not very keen on a short dress. I had been quite generous though so I used an inch to hem it. Alongside this I also made a little cardigan and scratch mitts. Baby clothes are so great for fabric scraps. I’m not sure about the dress, I think it is as I feared and doesn’t have enough shape at the waist for me. It’s seems to swamp my shape. I also feel it’s a bit too big. If I was to make it again, I’d downsize it. I seemed to have saved it with a contrast pink belt though! There’s no way I would wear it without a belt but I quite like the full skirt it gives. I was gutted to find that the fabric had a pinking shear cut in it when I tried it on. I don’t know where it came from. I had already made the dress at this point so I just sewed it closed. I hope it’s not visible and if you can see it, please don’t tell me because I couldn’t stand to know!!! This is the year I turn 30, this is the year I have been married 6 phenomenal years, this is the year we go to Portugal as an amazing treat from my in-laws. It is the year that I have to complete several of my psychology masters modules alongside many more blog posts but… This is also the year in which I have decided to BUY NO FABRIC AT ALL. Having only started sewing in May 2015, I have quickly become addicted and I have so much amazing fabric in my stash now. So much of my fabric gets pushed to the back of the queue by the next amazing thing I get distracted by so this year is the year I work through that stash. 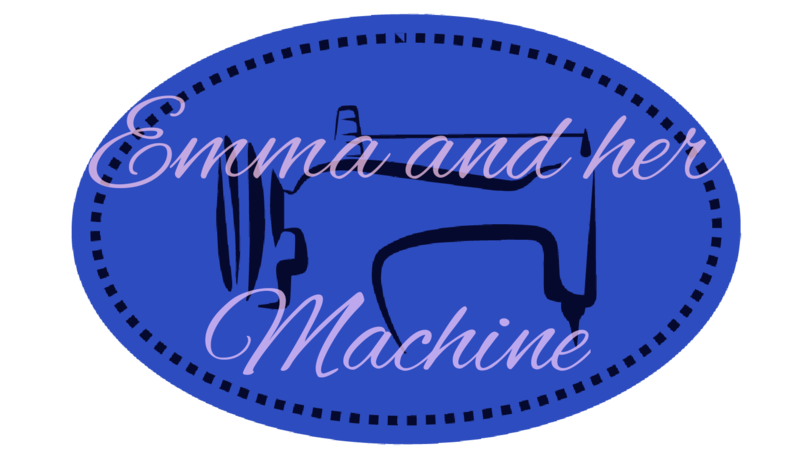 I think that last year showed that I’m finally getting to a place where I pass for a good Dressmaker so I’m ready for a new challenge, please join me whilst I make the most of my Stash over the year. I’ll share the highs and lows with you all. Though it means that I may not be posting as regularly as every Friday as I did last year. So… with this in mind. Let’s see what we’ve got to play with! This is no where near an extensive list but just some picks to inspire me! This was my last buy of 2017, it’s a viscose in this amazing purple aztec print which was on sale from my local market for £1.50 per yard! Amazing! It’s destined for a nice summer dress I think! This next one is a super thick Jersey from Ebay. This is a challenging one because it is so thick, I have 3 metres of it and I don’t really sew with stripes so the matching with be a tricky one! 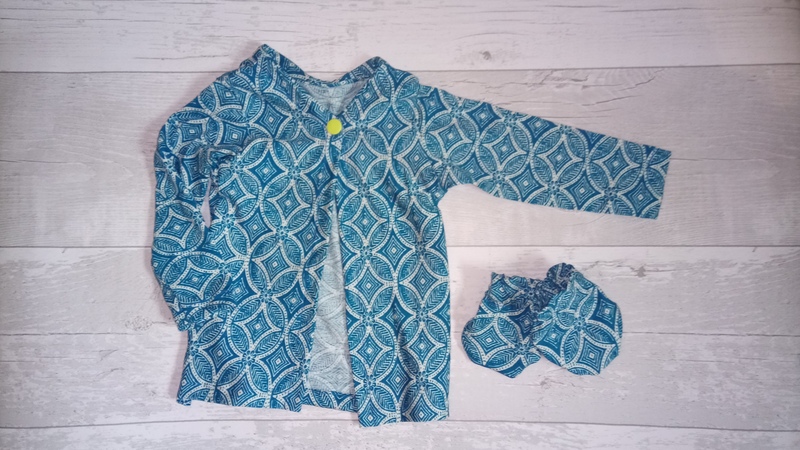 These next two are hopefully my last buys from Sew Me Sunshine but she has so many good offers and amazing prints that I’m going to struggle! Anyway, left if the Maribou Mosaic Cotton Lawn, which I’m not sure what in going to do with yet and the right if Dashwood Studio Leaf block print cotton which is lovely and sunny and is destined for a tea dress. This is a piece of Jersey which I got in the swap at Sew Up North last year which is one of the only fabrics I haven’t used from the swap. I’m thinking a tube pencil skirt for this one. This beautiful liberty print was a treat to myself last year, so much so that I can’t bring myself to cut in to it! I want to make a blouse with this but I want the ideal pattern first. This Beauty and the Beast fabric is a real piece of nostalgia for me and another cotton I’m struggling to cut in to. I’m still not entirely sure what I want to do with it. This Trefle Bee Gauze from Sewisfaction is so luxurious and soft, again, I’m thinking a blouse with this, possibly the Fringe by Cotton and Notch. Finally, another from Sew Me Sunshine which is the amazing pencil print and one I intend to make a pencil skirt with for a bit of fun! As I said, there’s plenty more but these are a few picks to be getting on with, you will see why I don’t need to buy fabric! I’ve had an amazing blogging year but I’m not going to do a round up because I’m so ready to look forward. Though I have done a vlog on my Christmas makes, if you’reinterested. ank you so much for all your support and to all my lovely sewing friends. Happy New Year to you and see you soon!